It’s no surprise that UT Dallas senior, Melanie Maurer, has an interest in matters of the heart. Upon meeting the backpack-toting biomedical engineering student, it’s equally clear to see that she’s prepared for the journey of combating heart disease. Bringing not only awards, knowledge, and volunteer experience into classrooms and labs, she also possesses a heartfelt smile and warm demeanor of someone you instantly want to know. A McDermott Scholar and Goldwater recipient, Melanie is a force in motion. 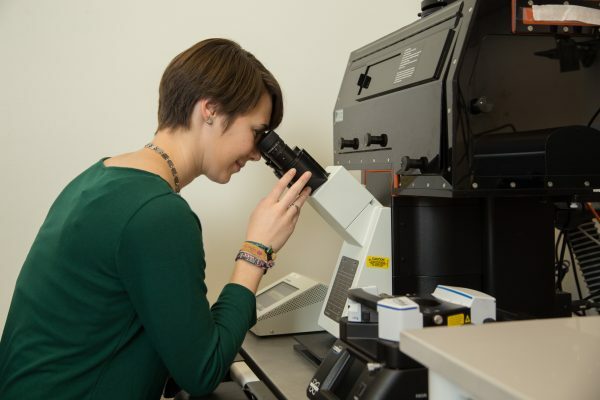 This Undergraduate Research Scholar Award winner has garnered experience in material science, cancer research, stem cell engineering, as well as biomaterials, and is currently applying her expertise to the study of atherosclerosis. While her coursework and experience are a lot to fit into any backpack, she’s carrying the load with ease. Melanie’s contribution to atherosclerosis is through research of macrophages, a specific type of white blood cell that lends itself to the formation of plaque in arteries. A major health concern in which arteries are hardened and narrowed by the deposit of plaques, atherosclerosis can develop as early as childhood. Caused by fatty substances, this build up damages the interior surface of arteries and can lead to the restriction of blood flow, triggering cardiovascular diseases, such as coronary artery disease. Affecting nearly 17.5 million people1 in America alone, cardiovascular disease is the deadliest killer worldwide. Economic costs related to this health concern outweighs any diagnostic category. According to the American Health Association2, recent estimated costs for an associated surgery or procedure averages $78,897. Cardiac revascularization, also known as coronary artery bypass surgery, costs approximately $149,480. By exploring the role and impact macrophages have in atherosclerotic plaque, Melanie aims to better understand the disease. Here’s how it works: macrophages assist with the removal of non-healthy substances and those materials not natural to the body, such as plaque. However, if the removal of the substances is inconsistent, macrophages can also cause responses from the immune system that can create an atheroma, or degeneration of the artery wall. In the removal process, macrophages absorb oxidized low-density lipoprotein (LDL), otherwise known as “bad” cholesterol, and become burdened with fat. If the inability to break down oxidized LDL and engage high-density lipoproteins (HDL) to remove these substances occurs, the burdened macrophages will expand and burst, leaving behind non-healthy substances and cell remnants. White blood cells are attracted to these remnants, which advances the process of immune responses and inflames the damaged artery. The buildup of plaque ultimately causes the muscle cells to stretch and thickens the endothelial lining, as well. Adversely, the artery wall is stiffened and less able to accommodate the heartbeat. If untreated, this will ultimately lead to a heart attack. For some, limited access to health services, supplies, and even preventative knowledge is an unfortunate reality. Melanie’s view of atherosclerosis isn’t regulated solely to the study of macrophages in the classrooms or labs, nor is heart disease exclusively about the complications related to restricted arteries. Expertise, combined with a volunteer spirit, took Melanie on a journey of outreach to remove the barriers of distributing education and training to the lives that need it most. The community of Marovo Lagoon is an example of those individuals facing healthcare adversity. Less than ten years ago, their undersupplied hospital in Seghe did not have electricity or running water. A participant in the Marovo Medical Foundation’s mission trip to the Solomon Islands, Melanie packed her backpack last May once again and traveled daily by boat to villages to provide clinic services. Melanie documents her excursion on the McDermott blog, which includes experiences conducting an environmental study, involvement with World Wide Opportunities on Organic Farms (WWOOF), and aiding in building an off-the-grid home. The high point of her travels? Daily interactions and teaching games to the village children. Like any student, keeping a balanced life is key. While Melanie intends to pursue a Ph.D. in biomedical engineering, but don’t be surprised if you catch this researcher on campus enjoying some free time with her hula hoop. She regularly practices yoga and meditation, paints, and spends time baking and cooking. Wherever Melanie and her backpack travel, we’re excited to hear about the next adventure. 1 Cardiovascular Disease. (World Health Organization website, January 2015.) Retrieved from http://www.who.int/mediacentre/factsheets/fs317/en/ on 21 January 2016. 2 Heart Disease and Stroke Statistics 2016 Update, A Report From the American Heart Association. (American Heart Association Website, 16 December 2015.) Retrieved from http://circ.ahajournals.org/ on 21 January 2016.